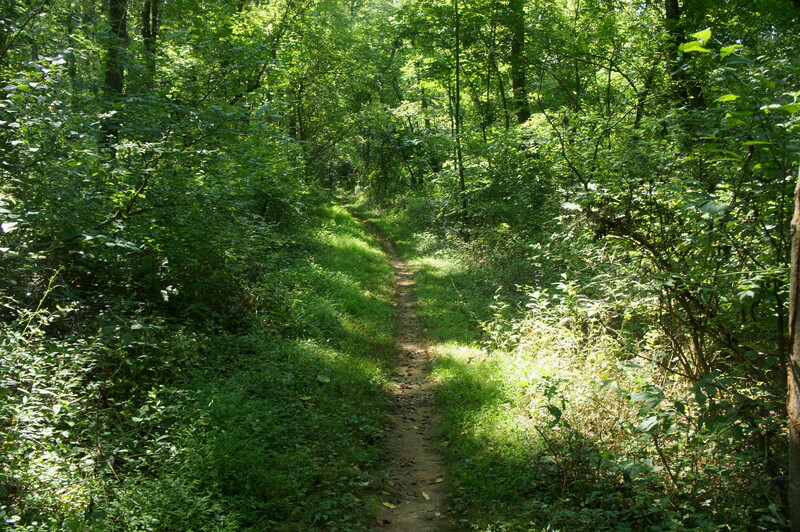 The first several miles of the hike follow the lower section of the Seneca Greenway Trail, a 35-mile footpath that extends from Damascus, Maryland to the Potomac. The hike begins as a wide, partly asphalted path heading west and paralleling noisy Route 28 to the left. Almost immediately, the trail crosses under power lines. After 150 yards, the wide path abruptly ends, and much smaller single-tracks bear left and right. Take a left, walking under Route 28. Seneca Creek, now seen on the right, drains a rather large watershed that extends into central Maryland. 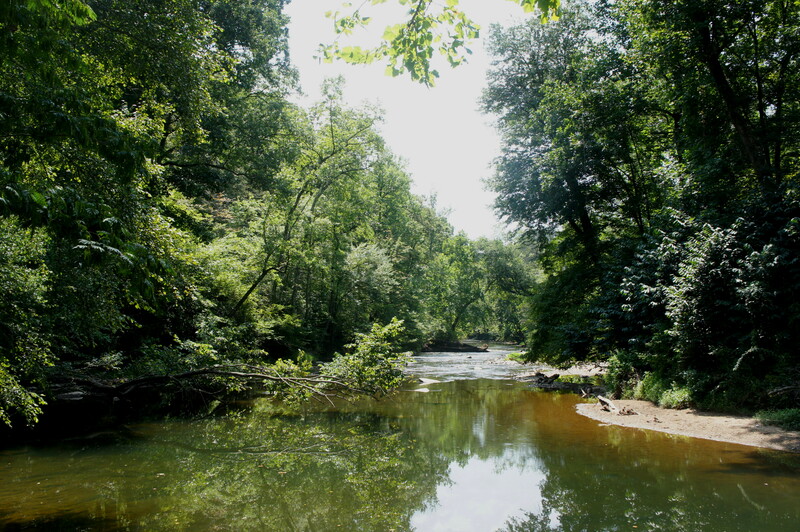 The water volume made it an attractive site for settlers in the 17th and 18th centuries, during which eight mills were built on Seneca Creek and its tributaries. By the 1800s, that number grew to 19. 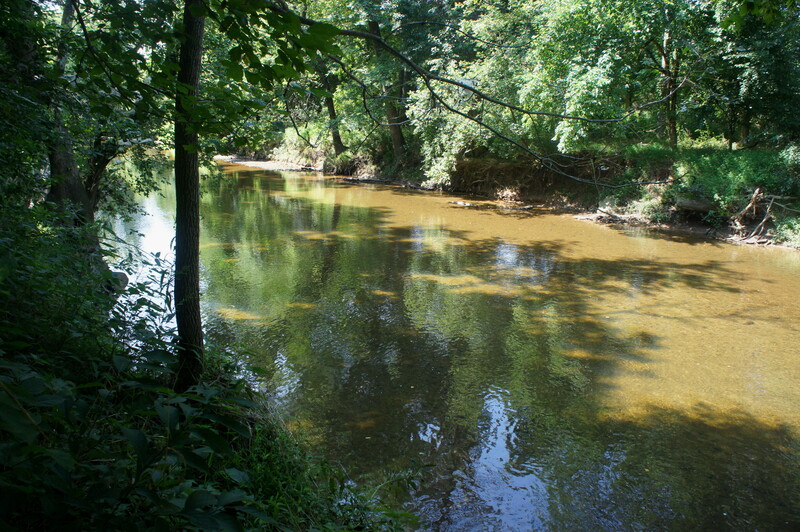 Here, the stream is quiet and peaceful, taking on a light brown hue as the sun bears down during the day. At 4/10 mile, a small gravelly beach offers an opportunity to go down to the water. At the ½-mile mark, the trail pulls away from the creek to clear a muddy tributary and then makes a short climb to the now partly-elevated floodplain. Continuing south, the path skirts an overgrown field on the left, sporadically dotted with conifers. Reentering the woods at the 1-mile mark, the trail cuts through a grove of tall and wily poplar trees, then returns to the banks of Seneca Creek. The view is fleeting, however, as the Seneca Greenway quickly dives off to the left, leaving the stream behind. From here the trail passes new growth forest on the left, then traverses a wooden bridge at 1.5 miles. Just beyond is a brief uphill climb, followed by a quick downhill. 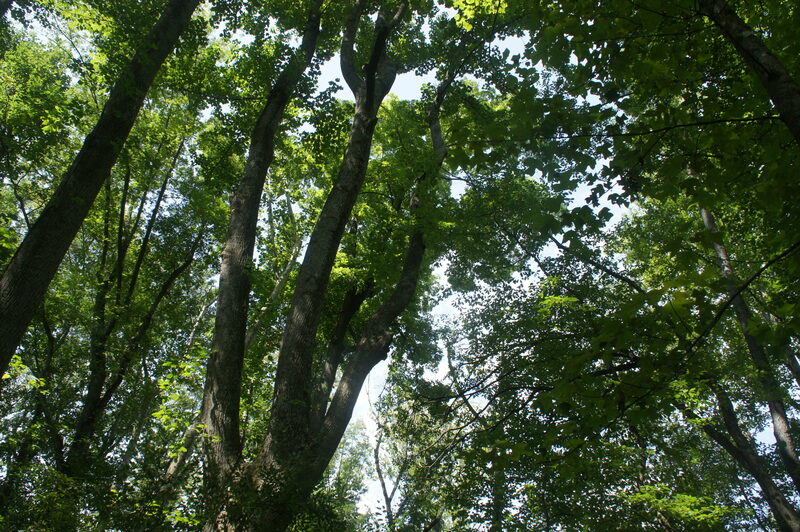 At 1.9 miles, the path cuts through a flat with tall, vine-laced trees. At 2.1 miles, a wooden sign emerges noting the arrival of the “Berryville Road Side Trail” on the left; stay right, bearing west. 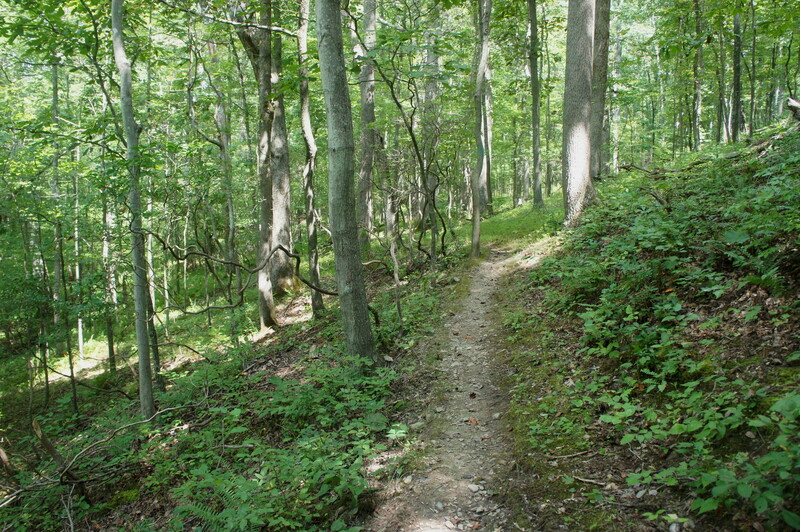 The next section is one of the hike’s most scenic, as the trail gradually descends a low ridgeline with views of Seneca Creek below on the right. At 2.5 miles, you will see what appears like a Christmas tree farm on the left—dozens and dozens of conifers, a sign of new growth on recovered farmland. 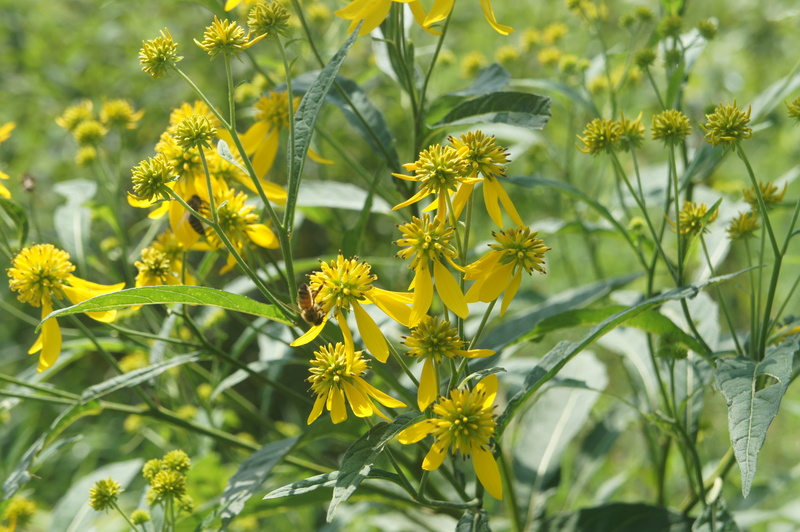 A field of yellow wingstem flowers—in bloom in late summer—follows shortly thereafter. Then it’s back into the woods as the Seneca Greenway bends southward. At 2.9 miles, stay straight at a 4-way junction, following the blue blazes. 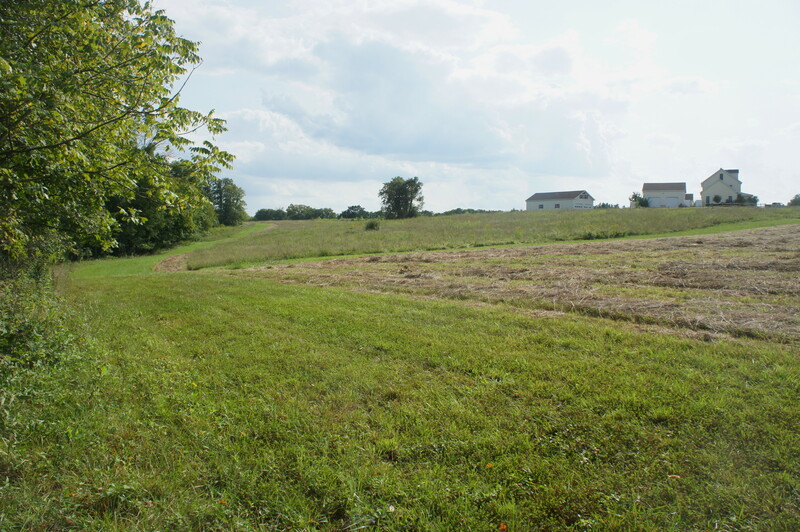 Around 3.3 miles, an open field appears on the left—cropland situated outside the park. Stay straight at the next junction, followed again by a fork at 3.75 miles. Here the woods give way to scrubby brush, occupying what is undoubtedly former farmland. It takes over ¼ mile to cross the open field, a welcome change of pace from constant woods. Continue east on the road for about 100 yards, where the Greenway Trail picks up again. 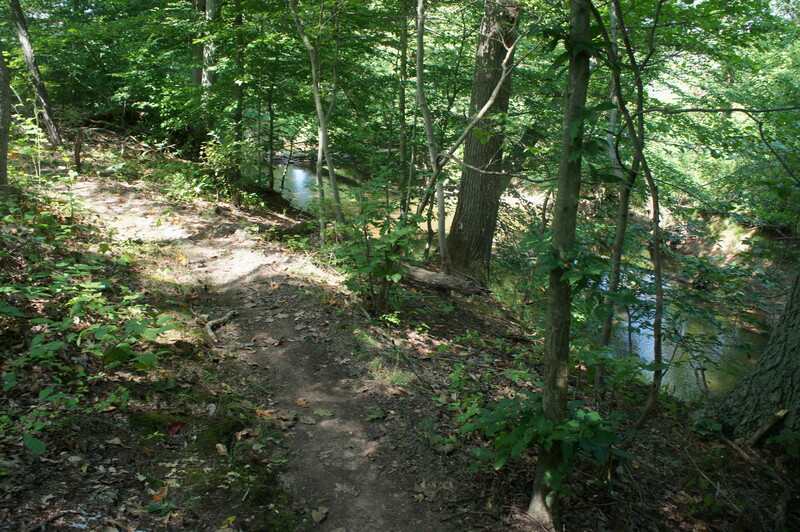 The trail here follows a slice of land between the road on the left and a perennial tributary—Hookers Branch—on the right. The path crosses Hookers Branch (requiring some rock-hopping) at 4.3 miles, followed shortly by the steepest climb of the day, gaining 75 feet in 1/10 mile. Once atop a ridgeline, the trail bears south, well above the creek down to the right. At 4.6 miles, the winding path traverses a deep ravine and then climbs sharply to the edge of a resident neighborhood; a house is visible on the left. Ferns are sprinkled along the landscape as the trail bears southwest, crossing a second ravine at 4.8 miles. Beyond, the terrain flattens out, and the path crosses a wooden bridge. The hillsides return past the 5-mile mark, but the trail remains relatively level. At 5.3 miles, the dirt path crosses another bridge and ends abruptly minutes later, spitting out onto the paved Seneca Road. 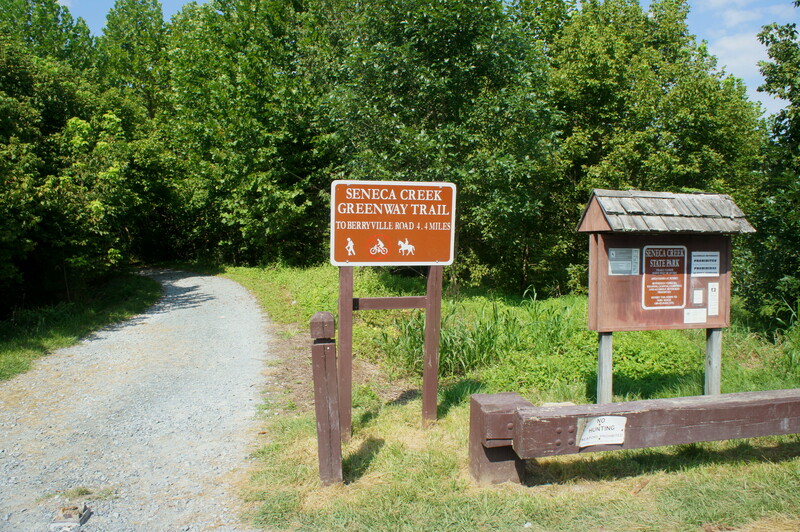 Take a right on the road; the Seneca Greenway Trail follows the pavement for ¼ mile to the intersection with River Road, marking the end of the first 5.75-mile section. Heading straight for now (we will return to the mill and the Seneca Bluffs Trail later), you must follow the paved Riley’s Lock Road for ¾ mile to the Seneca Creek Aqueduct. (Note: By now you have temporarily left the Seneca Greenway Trail.) The road is less than scintillating—crowded with passing cars and bounded by houses on the left—but it at least follows Seneca Creek on the right. 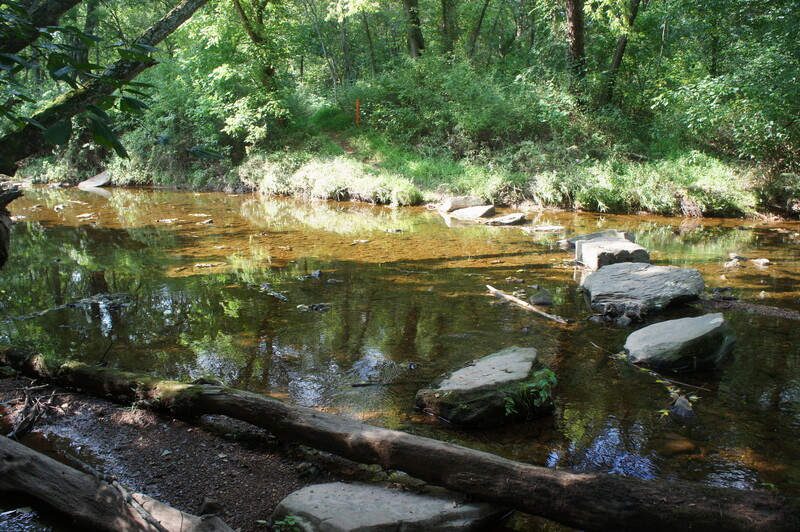 Around 6.5 miles into the hike, the road ends at the mouth of Seneca Creek, which flows gently here into the Potomac River, and Riley’s Lock (Lock 24). The land here is managed by the National Park Service as part of the lengthy Chesapeake and Ohio Canal National Historical Park. 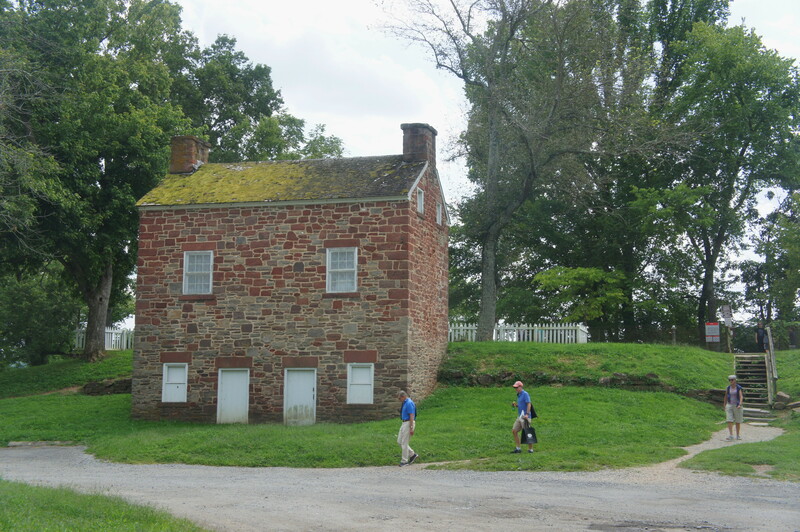 The red sandstone building ahead was the old lockhouse, home to a series of “lockkeepers” who managed Riley’s Lock and the Seneca Aqueduct. 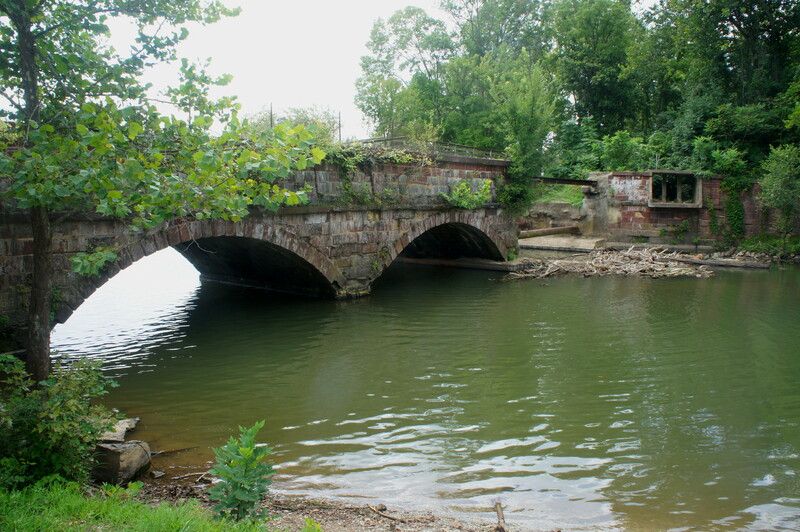 The aqueduct itself was the response to a dual challenge encountered in 1830 by the engineers of the C&O Canal: crossing Seneca Creek while also mounting an elevation change. The answer was a two-in-one structure that served as both an aqueduct and a lock, an architectural feat completed in 1832 at the cost of $32,000. 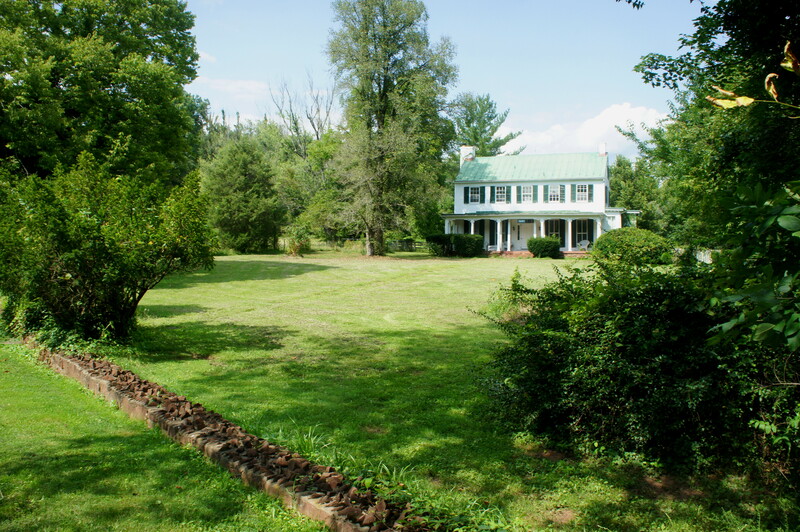 Its completion relied heavily on local resources—built with red Seneca sandstone quarried at a nearby mine and cut at the Seneca Stone Cutting Mill just to the west. Approaching the stairs leading up to the aqueduct, one will also notice a Civil War Trails sign, which traces the story of Confederate General J.E.B. Stuart’s Potomac crossing during the Gettysburg Campaign of 1863. In early morning of June, 1863—at nearby Rowser’s Ford—Stuart and his 5,000 cavalrymen traversed the river from Virginia and sabotaged the C&O Canal between Locks 23 and 24. One of Stuart’s brigades then followed Seneca Road to Darnestown, while the other two bore southeast toward the present-day suburb of Potomac. Such a scene can be imagined as you climb a set of stairs to the Towpath Trail, which follows the C&O Canal heading west and east and provides views across the Potomac River to Virginia. Take a right on the towpath, crossing over the aqueduct (at least what’s left of it, as a huge chunk has broken off). 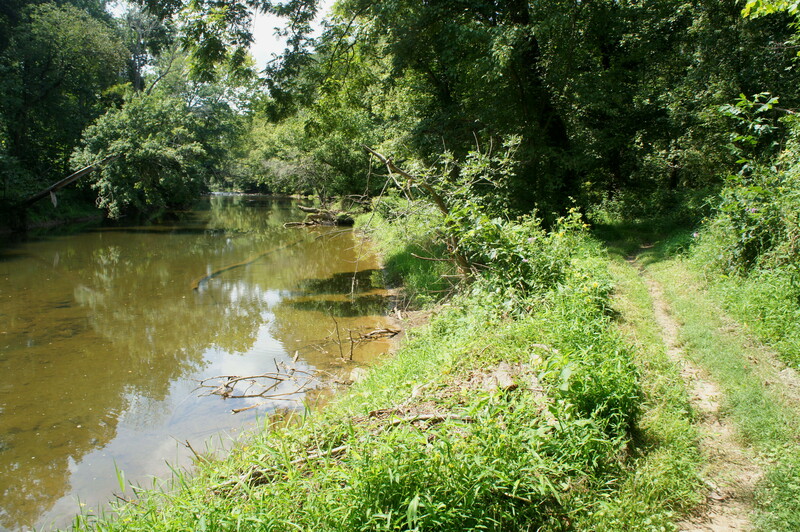 Once clear of Seneca Creek, there are a pair of picnic tables down to the left, situated in a small grassy field on the banks of the river. Stop for a break here to grab lunch and rest your legs—you’re only about halfway finished. 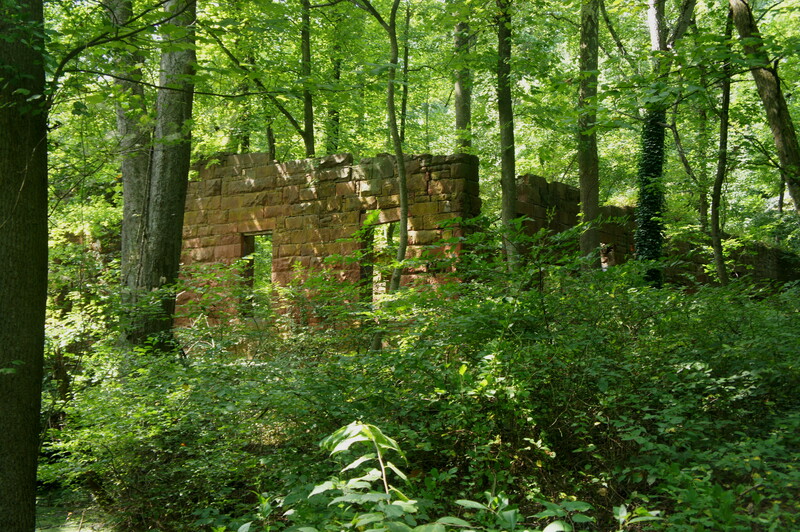 Beyond the ruins, follow Tschiffely Mill Road north (the road doubles as the Seneca Greenway Trail) as it parallels Seneca Creek—now on the west side—and joins with River Road at 7.4 miles. This marks the end of the worthy detour to the Potomac and back. 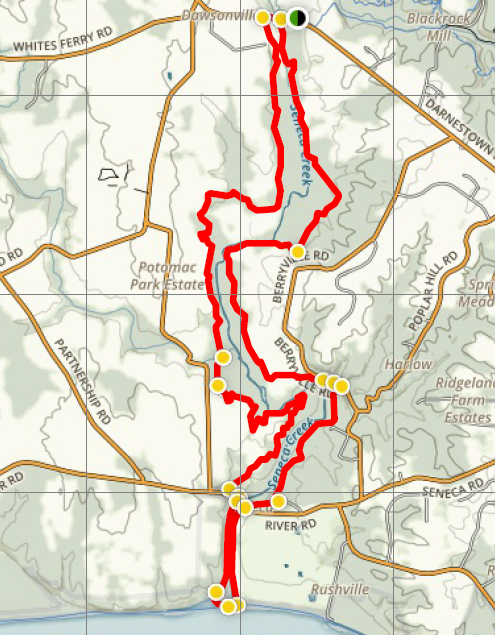 Continue up Old River Road as it rounds a left-hand bend and climbs into a more wooded area. At 7.5 miles—about 170 yards from the Seneca Store—look for an orange-blazed path leaving the road to the right. This is the start of the Seneca Bluffs Trail—your lengthy return route to the trailhead. 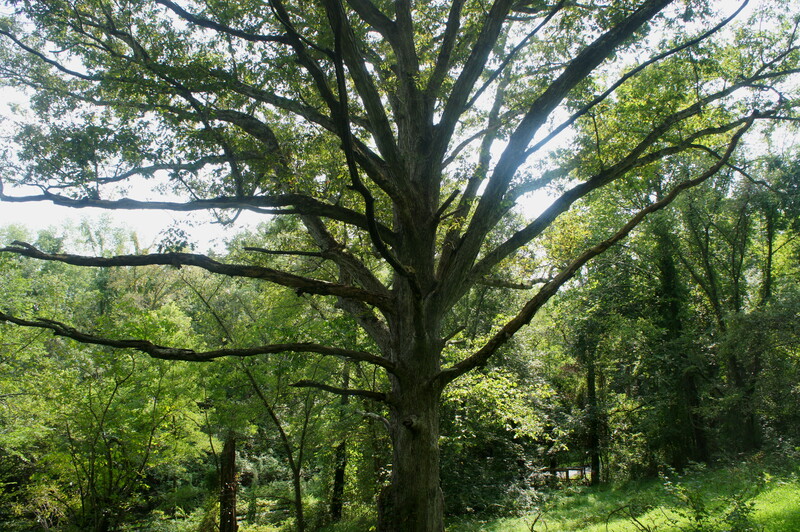 After crossing a wooden bridge, continue up the Seneca Bluffs Trail as it climbs a brushy slope and passes under the canopy of a tall, spindly oak tree. Quickly immersed in woodlands, the narrow footpath crosses over a small stream, then briefly traverses a field of high scrub. At the 8-mile mark, Seneca Creek is visible again down below. Minutes later, the trail weaves in and out of a tree cut (probably cleared to lay underground cables). For the next 4/10 mile, the trail bears northeast, winding around a wooded ridgeline, instead of over—likely a move designed to make it easier for mountain bikers (who are seemingly the principal users of this trail). 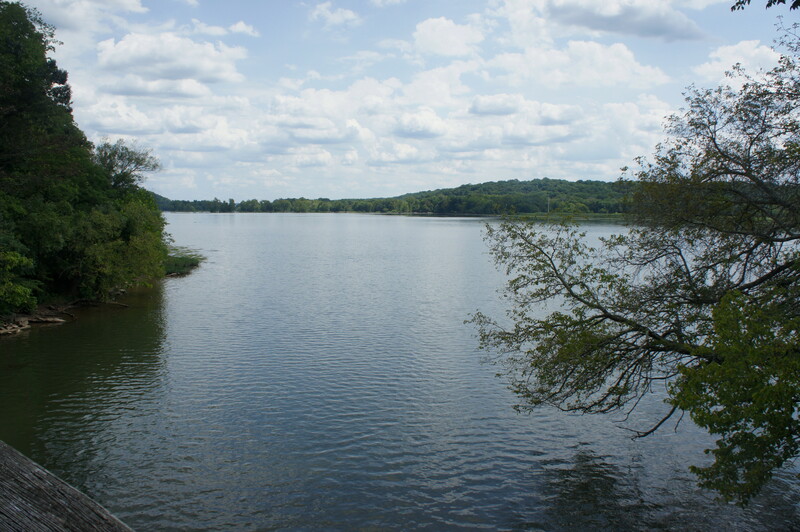 At 8.6 miles, the Seneca Bluffs Trail reaches the end of the ridge and wraps around to the west, with obscured views of Seneca Creek. Bearing southwest, the trail climbs curved slopes (obviously designed for speeding cyclists), then approaches a nice view of the stream valley around the 9-mile mark. After edging around a pair of thickly vegetated ravines, the trail heads north again. By now, monotony and weary legs are probably setting in—a condition partially alleviated by the convenience of a wooden bench at 9.85 miles. Here the trail splits; a spur heads west to Montevideo Road, while the main path continues right. 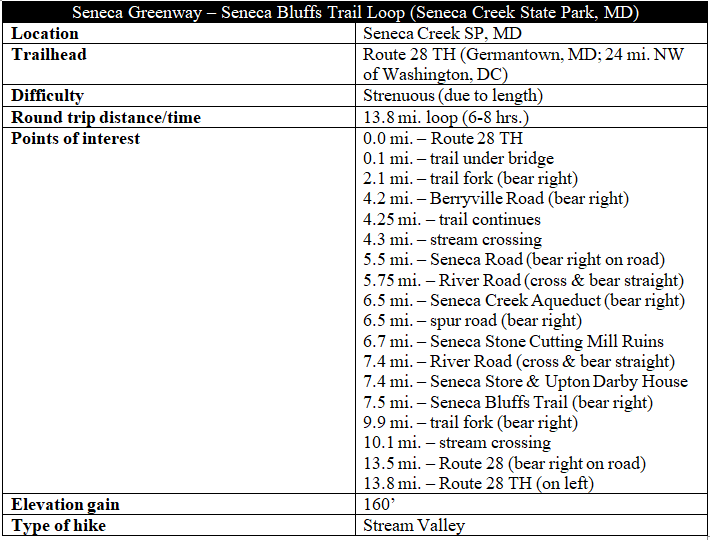 At 10.1 miles, the Seneca Bluffs Trail crosses Dry Seneca Creek, a tributary of the main waterway. The traverse of Dry Seneca—flouting its deceptive name—does require some rock-hopping to avoiding getting wet; however, it is a far cry from the “dangerous” stream crossing noted in warning signs that precede the creek. 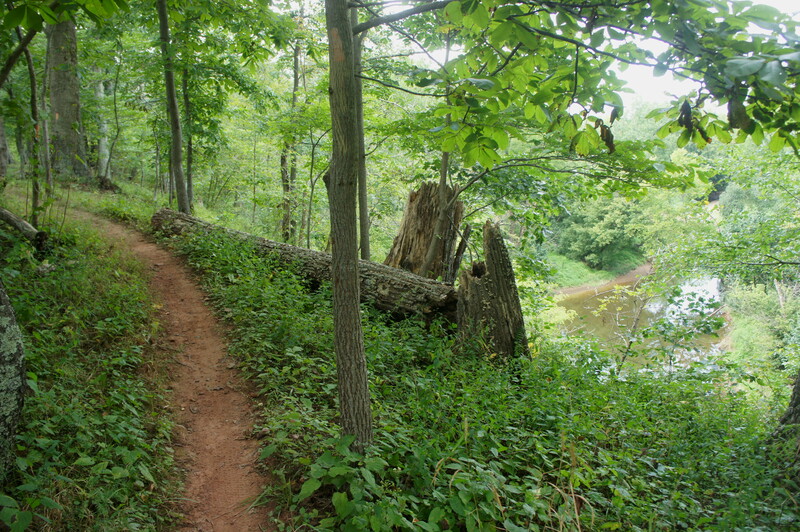 Beyond, the trail climbs gradually among the bluffs overlooking Seneca Creek. At about 10.75 miles, the route parallels a large farm, situated just outside the park, on the left. 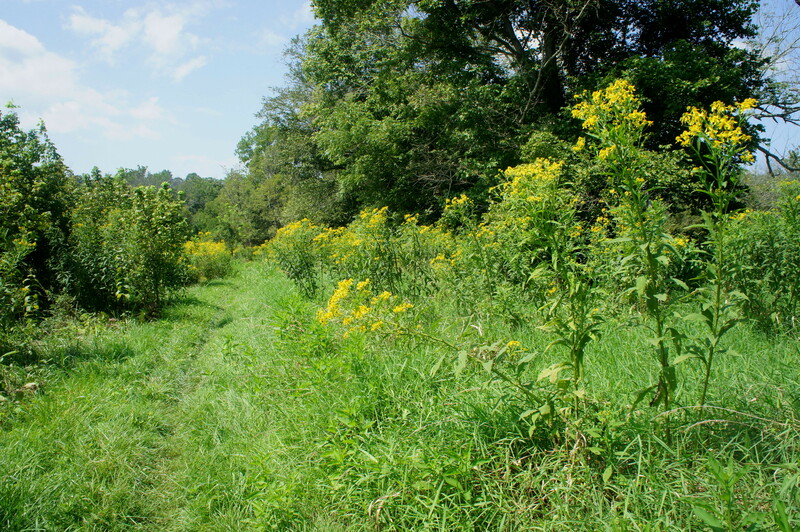 After dropping back into the woods, the Seneca Bluffs Trail edges around a minor ravine and emerges briefly at the edge of a second farm. Stay straight, following the orange blazes. Back in the woods, the trail skirts the western bounds of the park then bears east. At 11.75 miles, cross a wooden bridge over a peaceful stream. By the 12-mile mark, the trail sets a course that will run roughly due north for the next 1.5 miles. 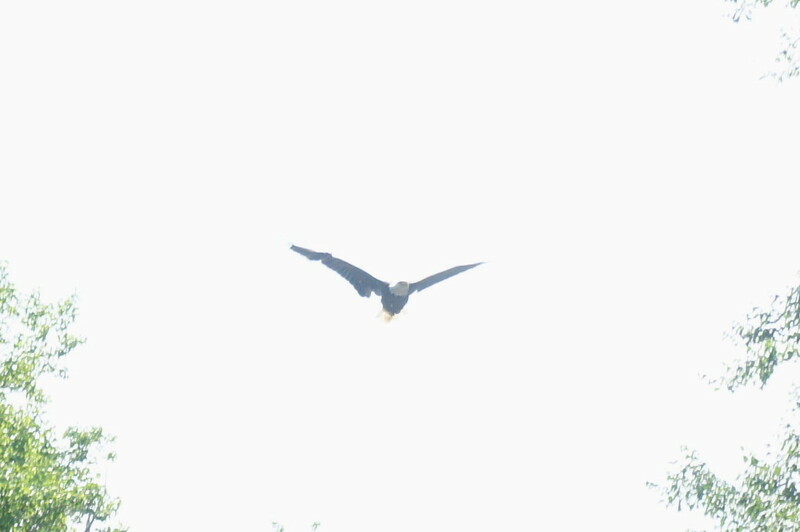 The bluffs begin to slowly recede, giving way to a shaded floodplain. At about 13.1 miles, an interesting set of exposed rocks on the left breaks up the monotony. The home stretch cuts through dense but sun-soaked scrub, likely another case of former farmland. At about 13.5 miles, the Seneca Bluffs Trail passes under power lines and ends abruptly at Highway 28. Use caution when crossing the road, then take a right, following Route 28 over the Seneca Creek bridge. The hike ends, at last, back at the Seneca Greenway parking area on the left—the terminus of a 13.8-mile workout. Time required for this hike will vary widely by fitness levels. In most cases, hikers will have to allot most of a day to complete the entire loop. This entry was posted in Chesapeake and Ohio Canal National Historical Park, Maryland, Strenuous Hikes and tagged C&O Canal, Chesapeake and Ohio Canal, Civil War, Dry Seneca Creek, historic, loop hike, Maryland, Potomac River, Riley's Lock, River Road, Rowser's Ford, Seneca, Seneca Bluffs Trail, Seneca Creek, Seneca Creek Aqueduct, Seneca Creek State Park, Seneca Greenway Trail, Seneca Stone Cutting Mill Ruins, stream valley, Towpath Trail, Upton Darby House. Bookmark the permalink.